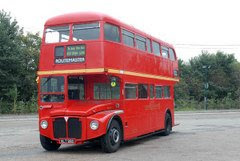 You think this is a BIG bus? It looks big. But when you put 22 (and more) cats, two dogs, buckets of temptations, a few litter boxes, some cushions, blankies and spiffy clothes, well, it gets a little crowded. So once again we are a caravan on our way across Texcats to visit Luxor. To his credit, he is getting ready. I don't know how ready he can be. We've been to Daytona and Miles drove the bus around the racetrack. We've had lizard stew at Daisy's. We even had roadkill armadillo by Angus' place. What a unique experience! You gotta read about THAT! Oh, I forgot to mention the LOVELY welcome Daisy gave us, and we had a great sightseeing trip courtesy of Moe & Mindy. You should check out the pictures! After the highly anticipated meeting of Lucky and Luxor, we will be continuing on the the Pacific, so Dragonheart (and the rest of us) can see the Pacific Ocean and partake of the sights there. Beezer, Daisy Mae Maus and Sophia and the buns have terrific plans for us. I can't wait. We will meet up with Kimo & Sabi (hope we don't have any trouble with the earthquake). Along the way, Poppy Q, Parker, Derby, Samantha & Tigger, Mr Chen & Ollie, China, Willow, Sanjee and others have joined us. Even though we are having a great time, we did all stop our silliness and have a moment of silence for dear Mia, who crossed the Rainbow Bridger last night. We are so sorry to lose her. Notes from the Road Trip! Oh my goodness, what an exciting day! I am having so much fun with all my pals! We are on our way to meet Daisy and Samantha and Tigger in Florida. We will be picking up Derby on our way through on our way to visit Luxor at home in New Mexico. We've had the most interesting things to eat at the Meezers, and we all got to run around playing thundering herd of elephants, and during the chinese fire drill at that intersection in Emporia Virginia. I am sitting in the front seat, Monty Q is driving and howling at the moon (he calls it singing). Lucky is beside me, maps firmly in paw. She is keeping us on a tight leash schedule. I'm having more fun than a barrel of monkeys. Wait a minute, what's different about a barrel of monkeys? We have two cars full of cats and dogs. I think we'll need another vehicle by the time we leave Daisy's, after all, cats need to nap during the day and it's getting a little crowded. Good thing I brought a portable litter box, because Miles is so excitable. Dragonheart is a real sweetie, and a great conversationalist. He can talk to anycat or dog about anything. There is never a lull in conversation when he's around. I can't wait to get to Daisy's. She's got a very special meal planned for us. I hope we get to see an alligator. It looks like our trip will take us to the Pacific Ocean, so we will get to see Beezer and Daisy Mae Maus, maybe even Sophia and the buns, Fiona and Orlando. Cheysuli, sure, bring Eric and Flynn and meet us at Lux's! That would be great! 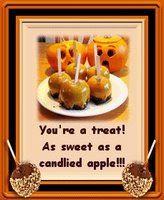 We expect to arrive there after dinner on Wednesday, just in time for some trick or treating! Lucky, Roxy, Moe & Mindy, Dragonheart, Georgia and Tilly and I are on the way to New York to pick up Sammy and Miles for our road trip to New Mexico to visit Lux. I had picked up Dragonheart at the airport earlier this evening. It was nice to finally meet him. He is -such- a gentlecat. Everybody likes him already! Since Mom is such a good cook, I convinced her to make some great road food for us. 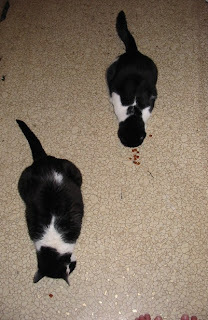 Mom has made some cat treats and some dog treats. (Mom rocks.) She's set up water bowls for us, and even a portable litter box in the back. We've all got harnesses, so we are driving safely. Of course, we have been listening to the Red Sox game. 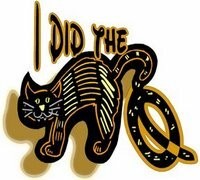 WE WON THE WORLD SERIES! How exciting! This is exhausting! I need a nap! Mom and I stayed up to watch the Red Sox beat the Rockies last night. It ended after one in the morning! We will watch again tonight, hoping the Sox will win the World Series. Mom says she wants another hat like this one. All this for a hat? 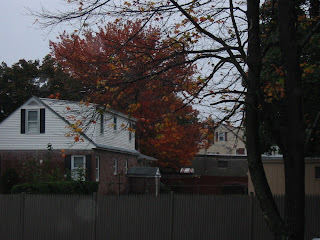 It hardly has any leaves left and we can see the neighbor's house. I went to Fat Eric's birthday party last night and met a lot of you. I met the Crew and Ruis for the first time; saw many other friends, and had lots of fun. 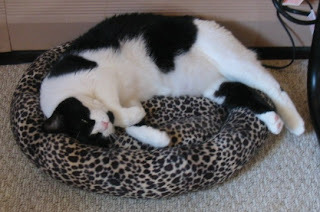 Everycat seemed to think I should convince Mom to get me a Mite as a companion. I dunno about that. I like being Top Cat. 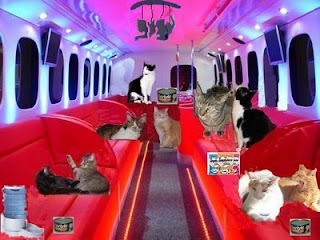 Oh and, I'll be going on a Road Trip with Lucky, Monty Q, Daisy, the Meezers, and a few others. We're going out to see Lux. You have to go see Roxy's blog to get the whole story. It's gonna be a really interesting weekend! And of course, I'll be rooting for the Red Sox tonight! Maybe it won't be a so-so Saturday after all! So many people commented about yesterday's post (which was about some of Mom's more unusual food items), that Mom decided to hijack my blog again, and post a recipe. 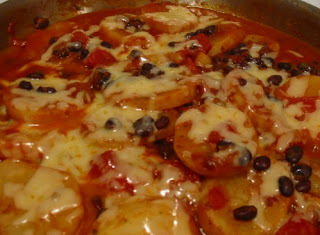 She decided to post a very easy one-pot meal that most people would like. And it's vegetarian, so DKM can try it too. Mom got the recipe from the Boston Globe many years ago. Mr Karate loves this, by the way. The ingredients aren't weird, but she says to make sure to use Yukon Gold potatoes. When you're finished with cooking, check out the Bizzy for Gizzy blog. Jan has posted about her quilt. And Fiona has a post on her blog about the one she just got today, but she hasn't got a picture yet, so you'll have to keep checking. In a large nonstick skillet, heat oil. (if you do not have a nonstick skillet, heat up a large skillet, add the oil, and let it heat up) Add onion and sauté until softened and starting to brown, about 4 minutes. Add undrained tomatoes, garlic, chili powder and oregano; mix with a large spoon. Add potatoes, beans, water, salt and pepper, and turn with large spoon to distribute evenly. Cover and bring a to a simmer; adjust heat and simmer, stirring occasionally, until potatoes are tender, about 20 minutes. If necessary, add more water to keep mixture juicy. Sprinkle cheese over top; cover, remove from heat and let stand 1 minute or until cheese melts. Mom watched the Red Sox destroy the Rockies in the first game of the World Series last night. She was no help in my TT blog, so I decided to list 13 Random ingredients she has in the kitchen all the time. I should tell you that I have no interest in any of these. Then again, I have no interest in most of what she's got in her kitchen. Except Beef. Note from Mom: I don't know what caught Millie's eye. I couldn't see anything. 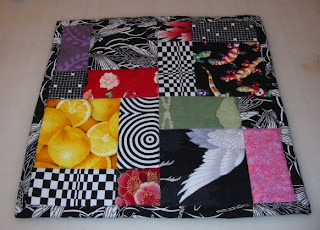 Check out Tigger's new Gizzy Quilt over at his blog; Samantha showed hers off yesterday. And Marie, Donny & Casey showed off theirs at Bizzy for Gizzy. 1. 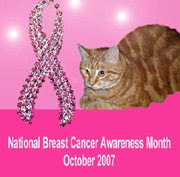 All women can get breast cancer, even those who have no family history of the disease. 2. The two most important factors for breast cancer and being a woman and growing older. 3. Women diagnosed with early breast cancer, when the cancer is small and has not spread, have a high chance of surviving it. Mammograms are the best way to find breast cancer early. Women should get one every year starting at age 40. If a woman notices any breast changes, she should tell her doctor without delay. 4. Women can help reduce their chances of developing breast cancer by engaging in regular physical activity, maintaining a healthy weight, and limiting alcohol intake. 5. Through early detection and improved treatments, more woman than ever are surviving breast cancer. Mom had her annual mammogram yesterday, and came back with this packet of goodies, including a nice beaded bookmark. For some reason, women are not having their regular mammograms, and this is not good. Make sure your Mom gets hers! It's a VERY good day to be a New England Sports fan. 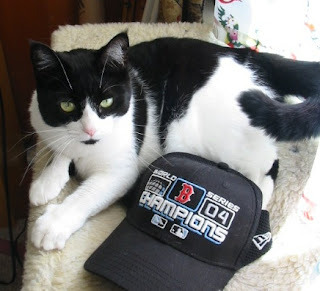 The guys named Pat beat the Dolphins (sorry Daisy), and the Red Sox are going to the World Series! Wow! Wow! Wow! Mom made me another quilt, twice as big as the last "table quilt." It's the size of half an ordinary Gizzy. I call it a Skinny Gizzy. 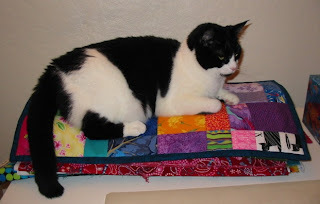 This one has pieces that many cats may recognize from their quilts... I see pieces from Mr Zenith, Parker, Charlemagne, Samantha, Beau, Marie, Freya, Daisy Mae Maus, Speedy, Daisy, Kimiko and Kona's quilts. Here's the back. I love it. It's really funky. And here I am trying it out. As you can see, it is just the right size. 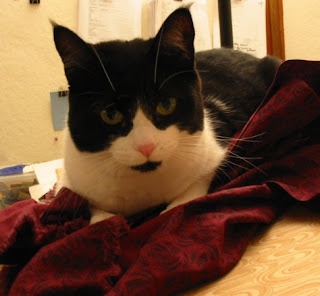 It's sitting on a stack of fabric Mom has to cut and iron. Mom's feeling poorly. She keeps honking. She says her nose is running, but every time I look at her, it's right on her face where it belongs. As you can see, there's something wrong with it. Can you tell she didn't ask me to do a QA check on it? Because I would have let her know right off that it was way too small. I let her know in no uncertain terms I need a bigger one. The guys named Pat are playing the Dolphins today, and we will be watching. Guess which team Mom and I rooted for last night? 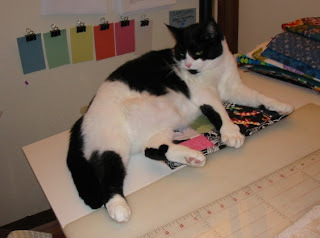 Here I am helping Mom in the sewing room. She's got a lot of fabric to cut into strips. Like this nice burgundy I am checking out. 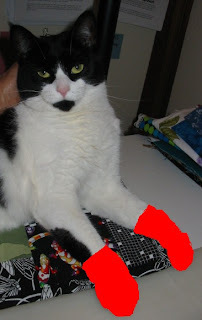 When she gets the strips cut, she will match them up into pairs, then sew them and cut them into what she calls "chunks." Sounds boring to me, so I'll be spending the afternoon at Derby's party. I'm quite looking forward to it. He throws a heckuva bash. And my dearest Monty Q seems to think he isn't "cool." 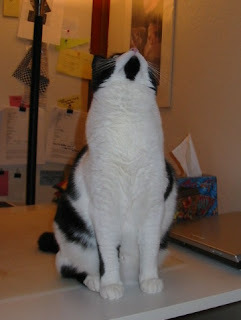 He's comparing himself to Luxor, (who is so movie star gorgeous) and feeling a little inadequate. Go on over and show him a little love! Of course, you all know what I think. 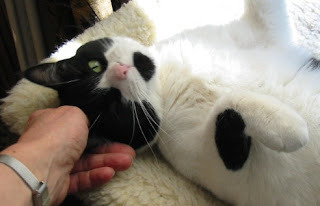 I think Monty Q is sweet, gentle, kind, thoughtful and, well, mancatly. He's my sweetheart. I'm biased. So what? Mom still has Blue and Halloween themed Gizzy Quilts for sale. They are ready to go to any cat who is interested. They make great presents. If you are interested, email me at: darlingmillie AT gmail DOT com. I found this on Roxy's blog, and thought it was fun. So I did it. Mom helped me with some answers when I got stuck on a question. Mom says your Mom is gonna LOVE this... so listen up! This is Anita Renfroe, and she has condensed everything a Mom says in one day into 2 minutes and 55 seconds, to the music of the William Tell Overture. Speedy & Sadie left a comment yesterday, asking what did I think would have happened to me if I hadn't been rescued by Malcolm. So today, I am posting "What-if Wednesday." But Malcolm did rescue me. But the v-e-t did fix my leg. 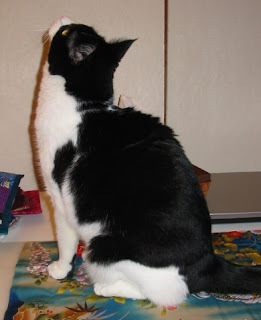 But the wonderful cats in the blogosphere helped with the green papers. But my Mom did adopt me. But I did make friends with Gizzy and Jasmine. 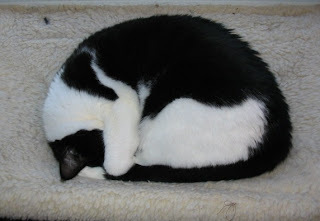 But I do have lots of friends in the Cat Blogosphere. I am so lucky. Who would have thought that getting hitted by a car would be the start of the best thing that ever happened to me. Now I am Top Cat! Life is different when you are the Only Cat. I like it a lot. In the morning, once I hear the squawk box go off in Mom’s room, I run over. After checking everything out, I jump on the bed and she pets me. I sit down, and then sometimes lie down near her. She’s under the covers, so I am safe. She pets me and gives me scritches. When she’s ready, she gets up and gives me my breakfast and fresh water. Later, while she eats, I sit nearby on the table. She’s got a towel up there just for me. I’m gonna have to get her to make me a special table quilt. She has to go day hunting, so she leaves, and I get all the nice sleeping spots to myself. 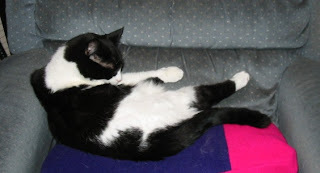 I can sit, or lie, or nap anyplace I want without worrying that somebody is gonna get mad at me. Life is sweet. I don’t watch for her metal machine to come up the driveway. Gizzy used to do that. When she does come in, I go on over and let her know it’s time to feed me. She doesn’t feed me right away. She takes off her coat, puts her bags away, and turns on the computer. Then she feeds me. I let her know if she takes too long getting my dinner ready. Sometimes I hang out with her when she makes her own dinner. She lets me smell stuff, but it usually isn’t very interesting. I bet Fiona bun would like the stuff. I don’t hang around while she eats. I’m off cleaning up and taking a little snooze. When she’s done banging the pots and pans in the kitchen, she’ll go into the sewing room, and I’ll jump on the table to keep her company. You know, she’s lonely since Jasmine has gone to the bridge. 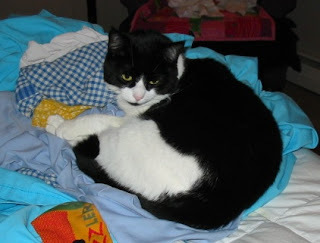 Besides, now it’s MY job to quality check all the Gizzy quilts. Usually I ask for treats after dinner, and since she always gets a little something for herself, she gives me treats too, so that’s really cool. What’s especially nice is that I don’t have to worry about getting shoo’ed out of the kitchen by a bossy cat. Now all the treats are mine. I don’t sleep on her bed at night. I sleep on my own. Gimme a break, will ya? Rome wasn’t built in a day. My blog today is dedicated to helping save the Environment. 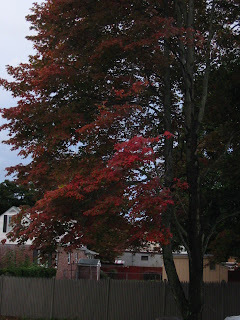 I live in New Hampster, which has cold snowy winters, and cool autumns. Lately our summers have been getting warmer, our first frost (temp 32F or below) has been getting later (we haven't even had one yet and it is mid-October) and this year we even had a 72F day in January! One of the ways Mom tries to help is by using canvas bags when she goes food shopping (I mean food hunting). She brings her bags with her to the grocery store. She has been doing this for 15 years. When they ask "Paper or Plastic?" Her answer is "Neither." We also recycle our cans, glass jars & paper. What are you doing to help save our Environment? I am taking care of business here, before I settle down to a nice easy Sunday. Brandi has given me this award: Thank you Brandi! I never thought of myself as sweet. I will most definitely have to nominate my own sweetheart Monty Q, and his sis, my pal, Poppy Q, and my wonderful big brother Beau, and our sis Parker, and my "cousin" Lucky. Lucky is definitely sweet, but I dunno about Roxy. I think Roxy is semi-sweet. 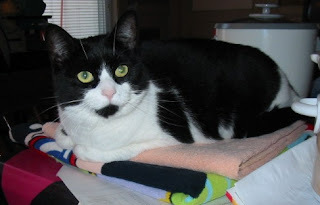 Mom and I have designed up some nifty quilts and sent the pictures to the cats who ordered them. While we are waiting for them to tell us to go ahead, we are putting together a few quilts we think some cats might like. So these three are for sale. As Mom and I finish these up, we will replace these "in progress" pictures with pictures of the finished quilts. They are all much prettier in real life than in these pictures. This first one is True Blue. This next one is Romantic Green. This last one is Halloween. You can click the pictures to biggify. If you are interested in buying any of these 3 quilts, email me at DarlingMillie AT gmail DOT com for all the details. It's getting cold out, so Mom has got a big batch of spaghetti sauce simmering on the stove. It has pork spare ribs in it, and it smells really good. I know I'm a big fan of Beef, but I think Pork is gonna be a favorite too. 1. The big one: Jasmine is gone. I am the Only Cat. 2. That means I am the Alpha Cat. 3. I demand Mom's attention quite a bit. 4. I demand she pet me for much longer periods than she ever used to. It makes her feel better. 5. I demand she pet me more often. Again, it makes her feel better. 6. I purr quite loudly now. 7. I can sit, lie, nap, play, wherever I want; even under the bed! 8. There are no Millie-free zones. 9. There is only one food bowl. 10. All the treats, all the Temp-ta-shuns, are Mine! 11. I jump on the bed in the morning after the squawk box wakes up. 12. I help Mom wake up by demanding to be petted. It makes her feel better. 13. Sometimes in the morning I lie down next to her on the bed while she pets me. You know, it makes her feel better. When in doubt, wash. When stressed, wash. When dirty, wash.
You all know that Jasmine didn't like me much. But I liked her. Sure, I teased her sometimes, but that's what sisters do. She was my big sis, and she didn't take any guff from anybody. She was a Champion cricket hunter, she was regal, and she could be very stealthy and sneaky. She was the very definition of aloof. In short, she was a terrific cat. 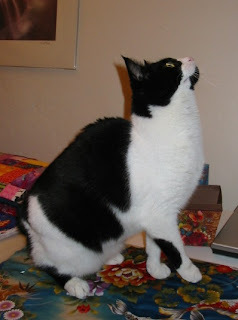 I confess I didn't treat her as well as I should have in this blog, but you all saw through my kittenishness to the wonderful cat she really was. 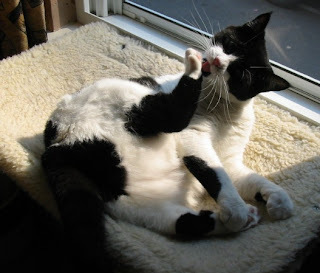 Once again, the thoughtful, caring and compassionate cats in the blogosphere have blown us away. Over a hundred comments, more than a dozen tributes (see the sidebar at left), and several private emails expressing their condolences have poured in, overwhelming Mom and I. Mom brought me into this family a little over a year ago because she thought that Jasmine was sick, and would be going to the Bridge. She turned out not to be sick, and we were all stunned when it was Gizzy who went to the Bridge first. 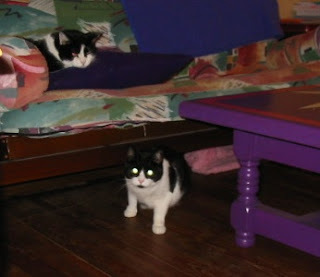 Now Jasmine has followed him, and while we know they are together, and happy, Mom cannot but think of how terribly sad (and lonely) she would be if she had not adopted me. Mom's eyes were leaking often over the weekend, as she read the comments and the wonderful poems of condolences in the special tributes to Jasmine. I've been making sure she pets me, because I know that makes her feel better. 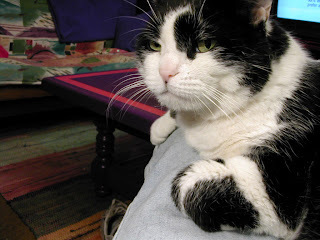 The picture below, of Jasmine on Mom's lap, was taken over 4 years ago, when Jasmine was about 10 years old. it's one of Mom's favorites of Jasmine. As you can see, Jasmine was as watchful and wary as ever. Mom was convinced Jasmine could read her mind. 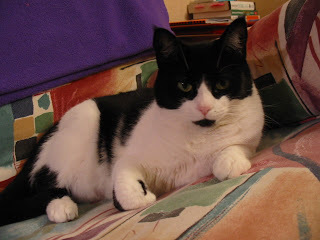 Cats of the Blogosphere, we love you! Thank you! 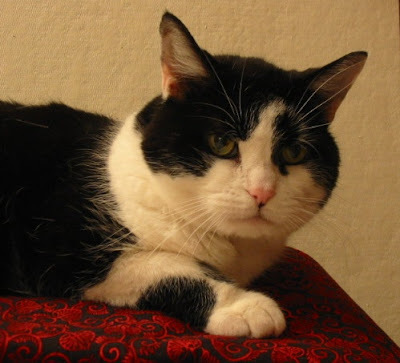 Jasmine joined Gizzy at the Rainbow Bridge late this afternoon. Everything was pointing to it being bladder cancer. Mom is really sad, and her eyes are leaking. We are gonna be off-line for a few days. We want to thank everycat and everybean for their kind words of help and support during Jasmine's illness. This is Jasmine (on the left) and me having treats last month. That's about as close as we ever get. Can you see Mom's toes? Mom's very distracted with Jasmine and all, so I have decided to lighten things up a bit with a post about her silliness. You all know she likes to cook. Mr Karate calls her kitchen "the kitchen of endless possibilities," because she can make practically anything you want with stuff that's already in it. But she says she can't do anything unless these 13 things are in her kitchen. Personally, I think she's crazy, because there is no BEEF on this list, but what can I say? I'm just a cat. 10:24 PM: Mom wanted to post this recipe, which uses 9 of her 13 favorite ingredients. Place tuna in pasta serving bowl and break it into large bite-sized pieces. Add garlic, lemon zest, lemon juice, olive oil, salt, pepper, and capers and stir gently to combine. Set aside to warm to room temperature. 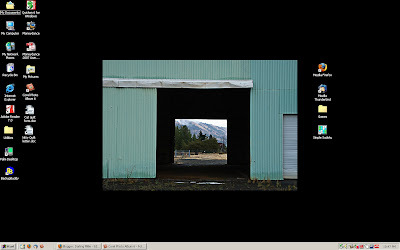 4.Tag five of your friends and ask them to give you a Free View of their desktops as well. 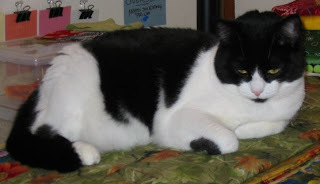 I tag: Pixel the Kitty, Kashim & Othello, Luxor, Roxy, and my sweetheart Monty Q.
P.S. Mickey... MOM IS NOT A RUNT! P.P.S.S. Mickey... You better believe you are lucky to live in Canada! And for the rest of you who don't know what this is about, check out Mickey's comments to my pal Roxy's blog post here. Check out Bizzy for Gizzy too! 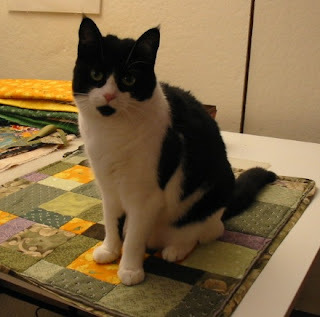 Five Kiwi cats, who were among the first to order Gizzy quilts back in February, have posted pictures of themselves and their quilts. They don't have a blog, so this is your chance to read their stories and see their quilts. Mom has ordered some stuff to take the pee smell out of the floor, and she also decided to try some Feliway, since she saw me trying to mark the nice yellow pillow from my tent. Has anybody got any experience with Feliway? Lookit - Jasmine and I in the living room with no rug. I was napping on my pink blankie, but Mom came around with the camera and I wanted to see what was going on. Mom has made this Halloween Gizzy Quilt. It isn't for anybody special, so if you know a cat who would like to buy this Halloween Gizzy Quilt, email me at darlingmillie AT gmail DOT com. And go check out Faz and Dragonheart's blogs. 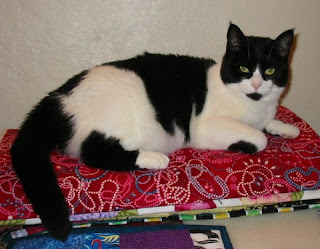 Faz is showing off her beautiful new Gizzy quilt, and Dragonheart is modeling his Holiday GizzyQuilt. Saturday night Jasmine seemed so much better. Mom got into bed late Saturday night and realized somecat had marked her pillows and sheets. Sunday morning Jasmine left a stinky poopie in Mom's room. Sunday afternoon all Hell broke loose. First Mom ran the rug sucking monster all over. Then she prepared a little tray with crunchies, stinky goodness and water and put it in the bathroom. Next she set up a new litterbox with fresh litter. After that she put Millie's bed in there. Oh, oh, I could see where this was going. Next was Mom got Jasmine and stuck her in the bathroom and shut the door. Jasmine wasn't too happy. I could hear her MEOWING all over the place. I should have seen what was coming next. -I- got stuck in the sewing room with the door shut. Mom's sister the Karate Lady was over. They had been talking about the ratty carpet in the picture box room. I dunno WHAT was going on, but it sounded really nasty. The carpet in the picture box room was GONE. (Of course, the picture box is gone too, but it was broken. 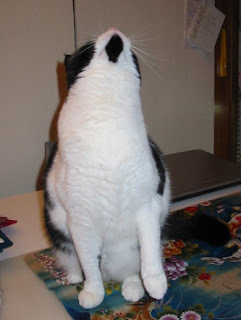 Mom says the new picture boxes are FLAT and REALLY EXPENSIVE so she isn't going to get one for a while.) The furniture was all stacked in the studio and the table room. But that wasn't the worst. 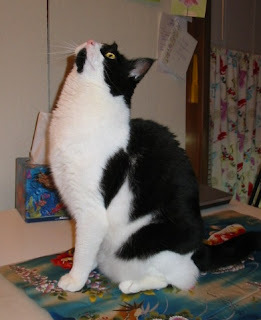 There was a big stinky black spot on the floor (hardwood, mind you) that stunk to high heaven of cat pee. The Karate Lady had had to open all the windows, and even then she had to leave because it was so bad. Mom had to finish by herself. That was not how she had planned to spend her day. She got blisters, cuts, and slivers on her hands, and they are still swollen. The furniture in the picture box (oops, I mean "living") room is all moved around. She has to go buy some special stuff to get the smell of the cat pee out of the floor. Jasmine got stuck in Mom's room with a tray and a litter box. (Which she hadn't used all day.) Mom says Jasmine's going to spend the next couple of days in the bathroom. Mom says Jasmine HAS to learn to use the litter box, or she's toast. Toast? What does bread have to do with any of this? Actually, I don't think Jasmine's gonna get toasted. She spent most of last night in Mom's room with her food tray (crunchies, stinky goodness, water AND some full-fat plain yogurt) and her very own private litter box. Did I tell you the door was closed? Mom has also keeps the french doors to the studio closed. Anyway, in the middle of the night, Jasmine wanted to get out of the bedroom. She woke Mom up, and Mom let her out. The only places Jasmine could go didn't have any carpeting. Mom wanted to make sure Jasmine used a litter box, and the only way to do it was to keep me someplace else. This morning Mom got up, and lo and behold, Jasmine had used the litter box in Mom's room and the litter box in the bathroom. So it's looking good. But Mom says we're still spending the day in separate rooms today. At least my room has better accomodations.